I Do Not Knock At This Main Gate Before The Day Of Mark The Evangelist ( April 25) And Then Not Before The 22nd Hour. II Anyone Entering Through The Main Gate, Should Not Wander From The Main Avenue. III Do Not Break Stems, Pick Flowers, Collect Fruit Or Seed, Or Pull Roots In The Garden. IV Do Not Touch Young Shoots and Do Not Tread Underfoot Or Leap Over Flower Beds. V The Gardens Are Not To Be Afflicted With Harm. VI Nothing Must Be Done Against The Will Of The Prefect ( director of garden). VII Any Contravention Of These Rules Will Be Punished With Fines, Imprisonment, Or Exile. VII When Visiting The Garden, Feel Free To Praise It Lavishly. Preferably Within Earshot Of The Gardener. IX Bring Along A Notebook To Write Down All Of The Brilliant Ideas and Designs The Garden And Gardener Provide. X Mind Your Children But Do Not Threaten Them With The Ire Of The “Wicked” Gardener. XI Do Not Mention Other Gardens In Comparison To This One Unless You Intend Using Names Like Versailles, Sissinghurst or Shangri La. XII Every Visitor Is Obligated To Tell A Minimum Of Ten Others About The Marvels Observed In This Garden. Failure To Do So Will Result In Punishments Already Stated ( See Rule VII). I think that covers just about everything relevant. I must now go in search of a suitable pillar preferably of ancient origin and, a well sharpened chisel. Everybody seeks inspiration. It is what keeps us going, recharged and with new resolve. As a gardener, nothing spurs me on as visiting other gardens. Private or public, well known or not, large or small, other people’s gardens serve me big time. There is without question something to teach me, excite me or thrill me. 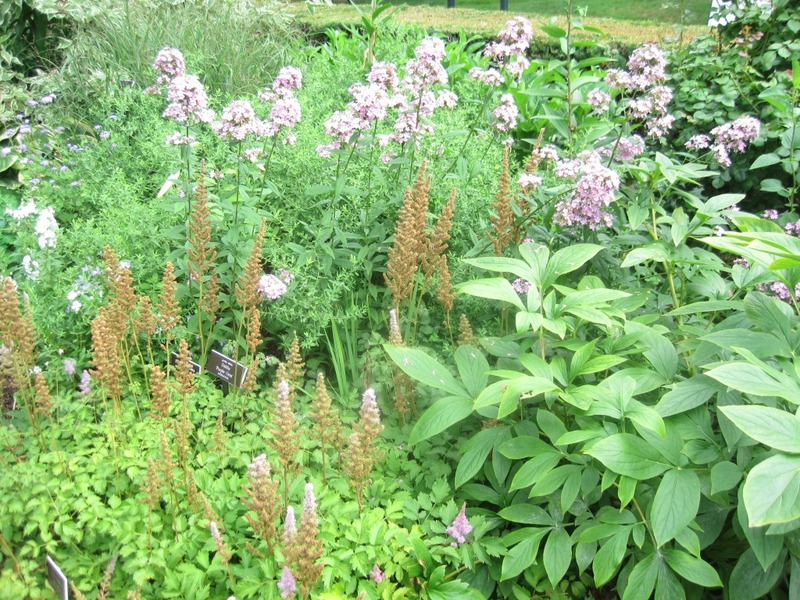 In equal measure, the interest and enthusiasm of a visitor, will please the garden owner no end. Everybody wins. It was just so on a recent trip to Andover, Massachusetts. I was there to visit with friends and work on designing a garden. The perfect weather made it very easy to succumb to distractions of the outdoor variety. 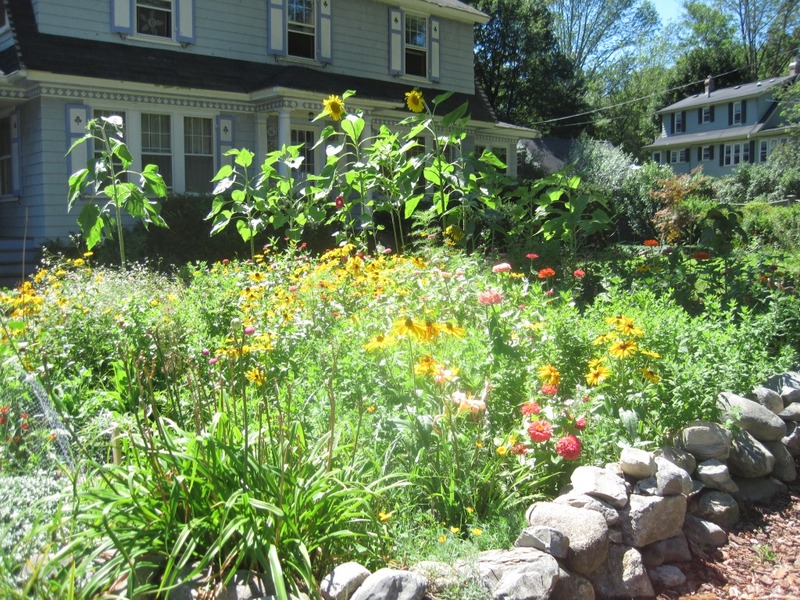 Before long, I had temporarily shelved work so I could see this ‘fun’ garden in the neighborhood. And there it was – a riot of summer energy beckoning all who passed by. 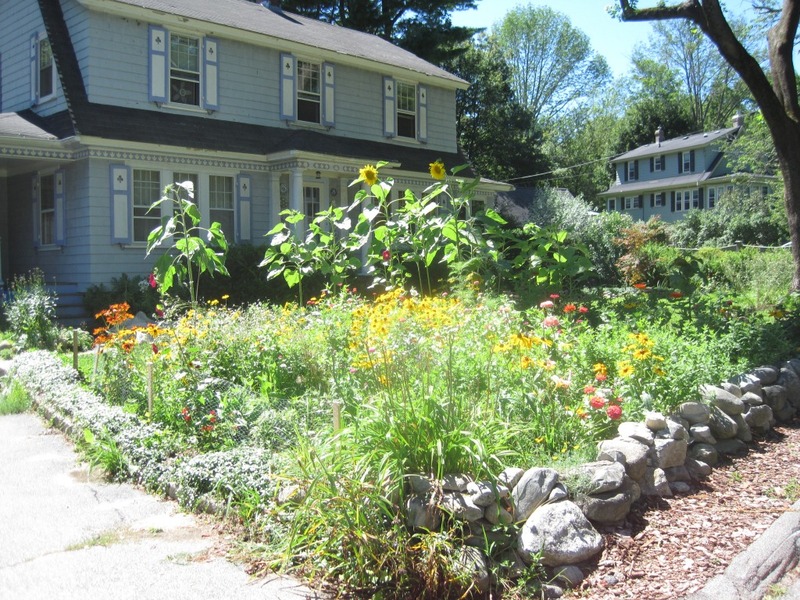 I could not stop smiling when I saw this front garden right by the street. 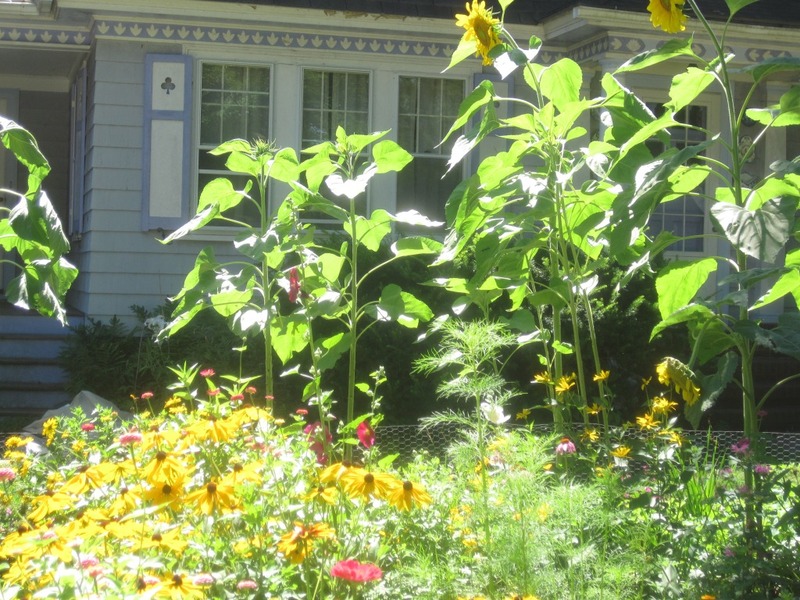 Giant sunflowers towered over purple coneflowers, zinnias, bee balm, phlox, hollyhocks, daisies, rudbeckias and other seasonal flowers. It was a squarish bed of raucous color and exuberance. 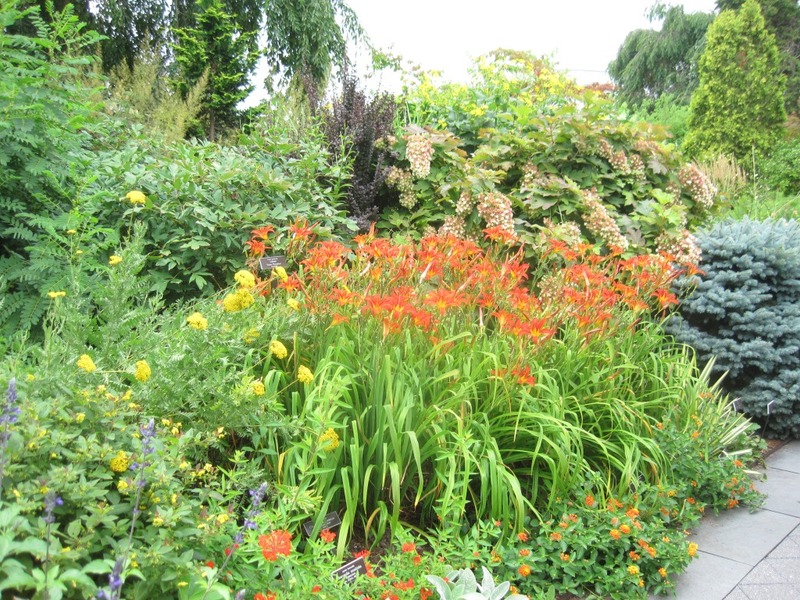 Not particularly designed with any deliberate mix of shrubs and flowering plants or taking into consideration a deliberate combination of foliage, shapes and textures, this was very much a cottage garden. It was indeed pure fun. Clearly, the gardener had created it for the singular pleasure of passers-by. Such a generous, happy gesture. As I paused to look from the car, the gardener herself returned home. It was only right that I get out, introduce myself and tell her how much I was enjoying her “public” garden. Typically, she was very pleased to hear this and went on to tell me more about her efforts and thoughts. 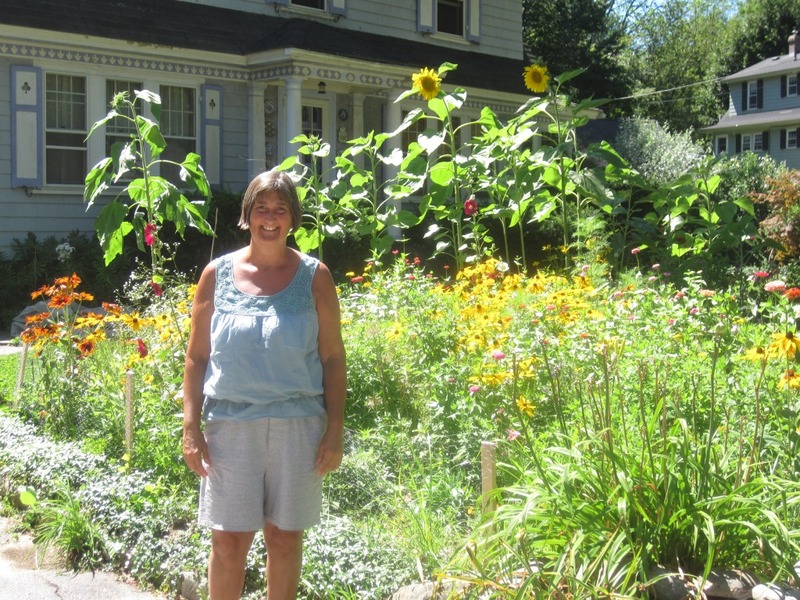 She applies organic practices, keeps bees, grows her own vegetables and clearly loves doing it all. I got to see the rest of the garden, received a mix of sweet William seeds harvested right then, caught a glimpse of her passionate nature, appreciated her knowledge and experience and felt once again grateful to belong to this ever expanding circle of fellow gardeners. 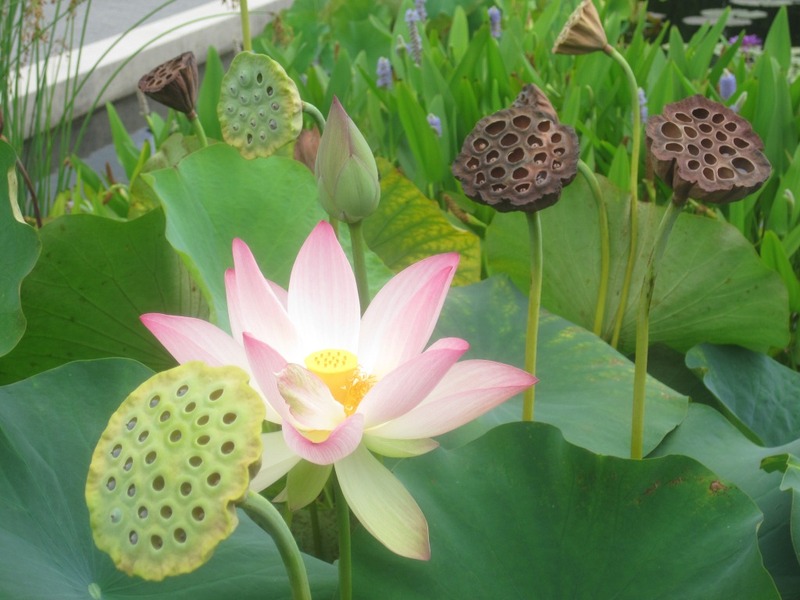 What an unexpectedly rich garden visit this turned out to be. I hope Maria continues to offer such charm and beauty to her neighbors. I hope even more that some if not all will follow suit. Enjoy the images of Maria Cusuman’s garden. Be inspired. 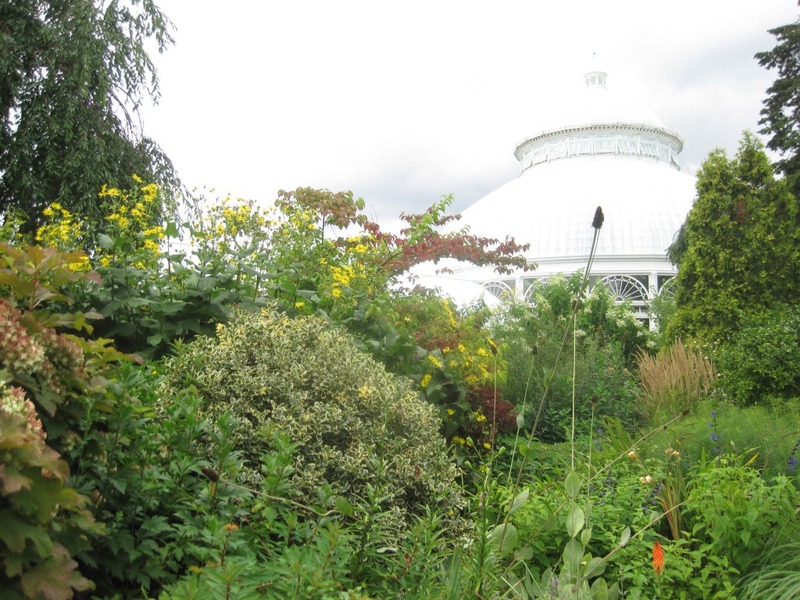 A couple of weeks ago, I went to the Wild Medicine: Healing Plants Around the World, Featuring The Italian Renaissance Garden exhibit at the New York Botanical Gardens. It was a beautiful day which, around these parts has become an increasingly rare occurrence. 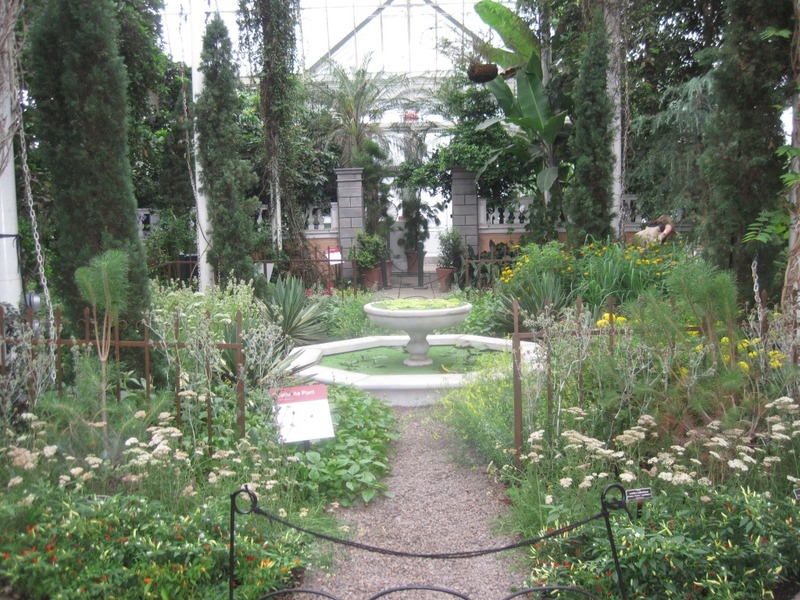 So it was but natural that I’d want to meander my way around the well known perennial gardens. Everything looked healthy and robust. No leaves hung in various states of attack by pests. No plant lay prostrate gasping their last due to thirst and sheer negligence. 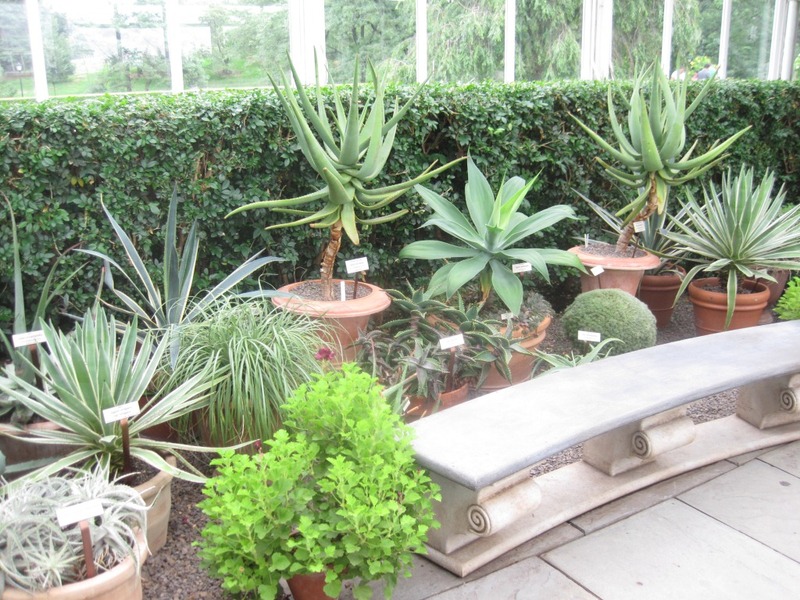 No weeds poked maddeningly through the resplendent plants. All was as it should be. Just as I envision my own garden in the torrid month of August. However, as I wandered casually around these lush beds, my mind kept receiving images of my garden in its actual condition. Some evil gremlin was transmitting shots of my plants looking limp, disheveled and hungry, facing an advancing infantry of weeds in brilliant Roman formations, with squadrons of Japanese beetles standing by to strike amidst shock and awe. It was disconcerting at the very least. Why can’t my garden look this healthy at this time of year? I kept asking myself this question as though I was expecting the answer to show up like graffiti on the large, slug free leaves of the happy hostas. 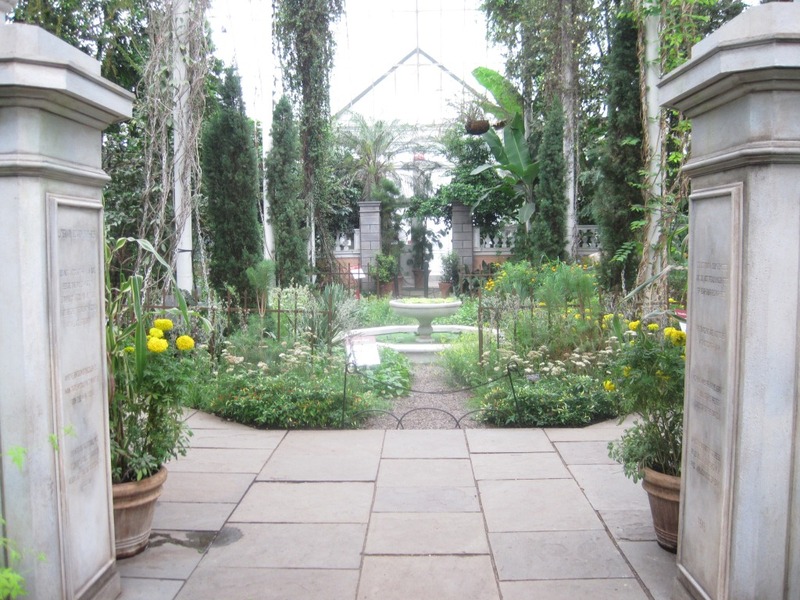 So lost was I in my dissatisfied thoughts that I almost tripped over a water hose snaking all over the paths and being directed by an NYBG employee. And there was my answer! First and foremost, unlike the NYBG, I do not have a cadre of helpers working round the clock on my garden. I work on many other things in addition to the garden. Which naturally means neither garden nor the other things ever turn out perfect. My help is sporadic and that too from semi-reluctant family members. Then, I’ve long made the choice ( took the high road so to speak) to not coddle my garden with watering. I only water plants in pots while those in the ground are expected to search out ground water and make it on their own. This eliminates fuss-pot plants. Only the truly hardy survive. As far as possible, collected rain water is used for the pots. Water used on the vertical garden is recirculated so excess does not go to waste. So there. After all, anybody can just keep pouring vast quantities of water but is that good practice in today’s water endangered/challenged world? Aha! Feeling a bit better about matters at home, I spent the rest of my visit duly consoled and able to fully appreciate the sheer mastery of design in creating these beautiful gardens. 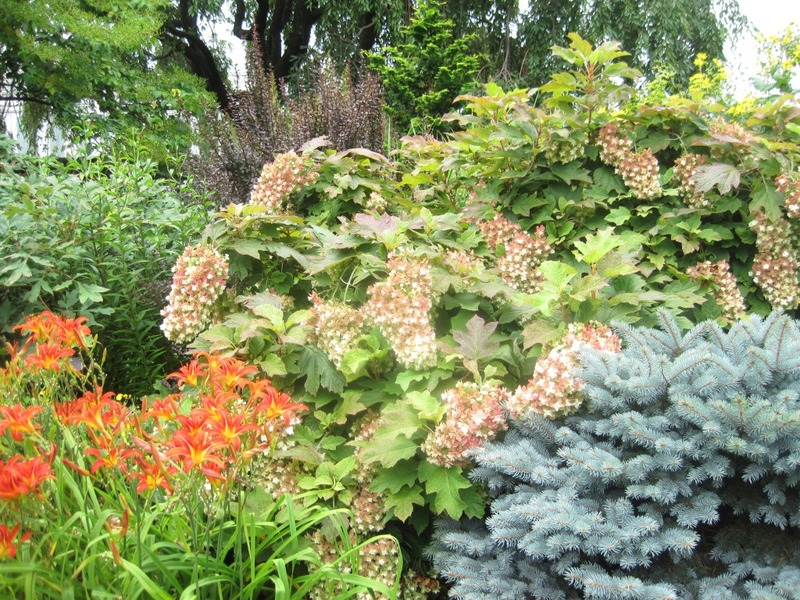 The brilliant selection of plants, the play of color, shapes and continued seasonal interest. I bowed my head. I was in the presence of greatness. 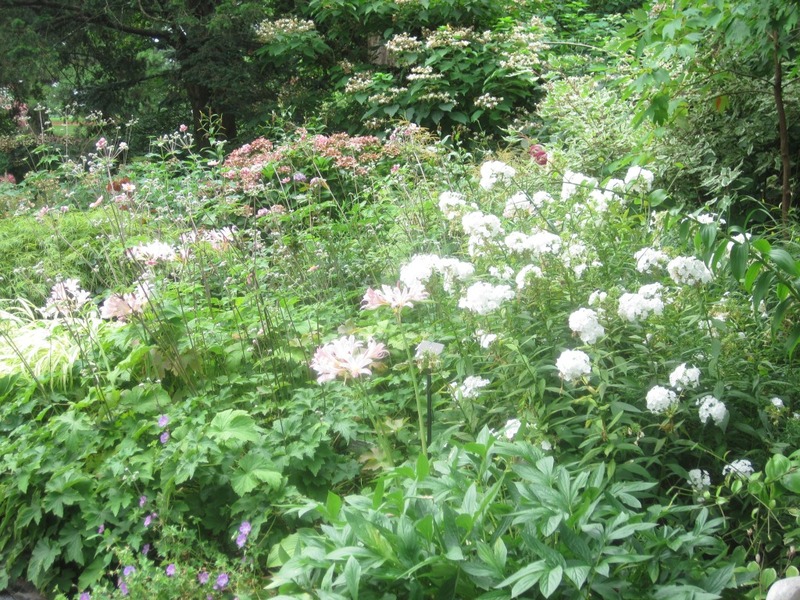 When I returned home, I gave thanks to my garden for putting up with my rather hands-off style of gardening. Like children who turn out okay despite negligent parents, my garden is doing just fine. ponds are lovely at this time of year. Of the various things that I do, gardening is the most satisfying and forgiving. By that I mean, when I paint or write, I’m forever questioning the quality of what I’ve just accomplished. It can always be improved. Or different. The work is right there staring at me asking for better. When I exercise or take a walk, I wonder if I’ve exerted enough. Invariably my conscience feels guilty and my body bears testimony to my sloth. I cook or bake and it ends up falling short of the perfect version begging for a re-do. But not the garden. It accepts whatever I do without reproach. I’m allowed to work sporadically or in bursts of zeal and energy. My mistakes are quietly endured and my successes are amply rewarded. It is my muse. No wonder I love to spend time in the garden. I try to paint outdoors whenever the weather permits. The pleasure of creating to the accompaniment of bird songs, the steady thrum of bees and the gentle rustle of leaves as a breeze blows through is nothing short of sublime. Add to this the fragrance of flowers and herbs and you’re envisioning a work space that beats a corner office every time. With Wi-Fi, I can do my writing, communications, reading and designing work in the garden. I admit that sometimes, I’m distracted by the beauty of what is in bloom, the visits of butterflies or the antics of the birds. But, I’ve learned to factor those moments in my schedule. And I’m all the richer for it. For instance, cardinals thrill me. The sight of one instantly puts me in a good frame of mind. I think of them as good luck charms. 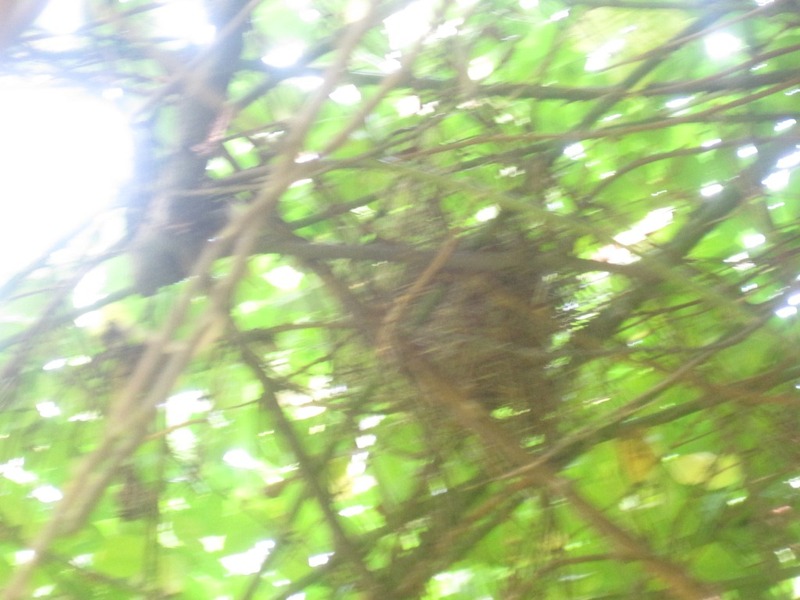 Out of academic curiosity, I’ve been in search of their nests for years. They’ve always been honored guests in my garden but where they nested eluded me. Then a couple of years ago, whilst puttering in the garden, I spied cardinal activity in the ‘Heritage’ rose bush. In the fall, I went to inspect said bush and came upon the most loosely woven, delicate nest of thin peels of grapevine bark. I use grapevine prunings around the peony supports so, they had been very accessible to the cardinals as this rose bush sits right next to the peonies. I don’t usually remove nests but there was simply no way this nest was going to survive the winter. So I brought it indoors to gaze and admire at leisure. Nothing other than the peelings were used. The cardinal is a minimalist! Such exquisite, sculptural work deserved due recognition. Since then, I’ve applied the same approach to my art – distilling things to the bare essentials. Thank you dear feathered friends. 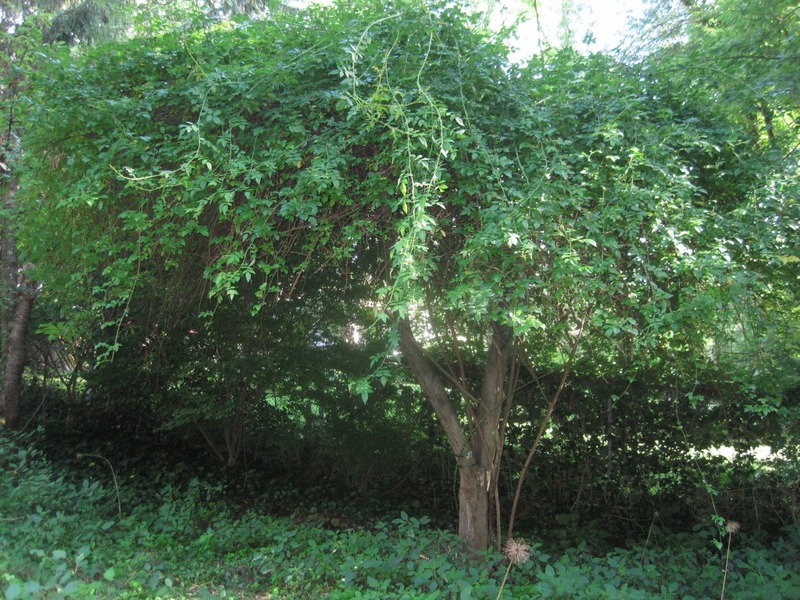 More recently, looking up from writing, I watched a cardinal pair flit to and from the tangled canopy of Paul’s Himalayan Musk rose that scrambles up and drapes over an ancient apple tree. I sneaked under this ‘bower’ to look closer. 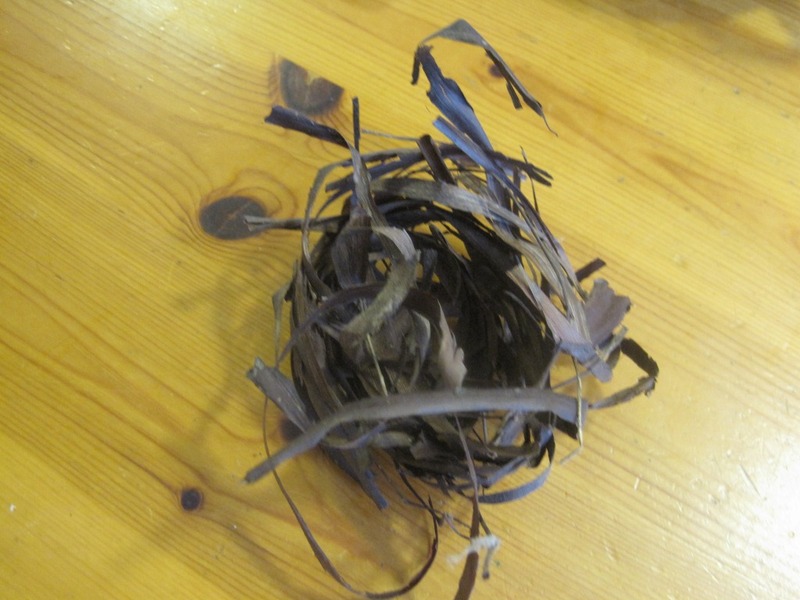 Sure enough, there sits another filigree-like nest made solely of just one type of twig. I wish I could get a look at the eggs but a formidable dome of highly thorny stems thwart any such attempts. What a brilliant location. Perhaps once again in the autumn, I’ll try to get a more intimate look at the nest – from atop a ladder. I wonder if cardinals have a preference for roses. It looks that way in my garden. More likely, they seek places that are not particularly friendly to inquisitive critters and certain humans. I could Google and learn all sorts of things from the proper authorities. But where is the romance in that? It is infinitely more rewarding to let the garden teach in its gentle, hands-on way. Much wisdom and wonder comes from merely hanging out in the garden. Just this past Sunday, as I looked up from the newspaper, my eyes rested on the tall Angelica in the corner of the herb garden. For reasons I cannot explain, I decided to inspect it. 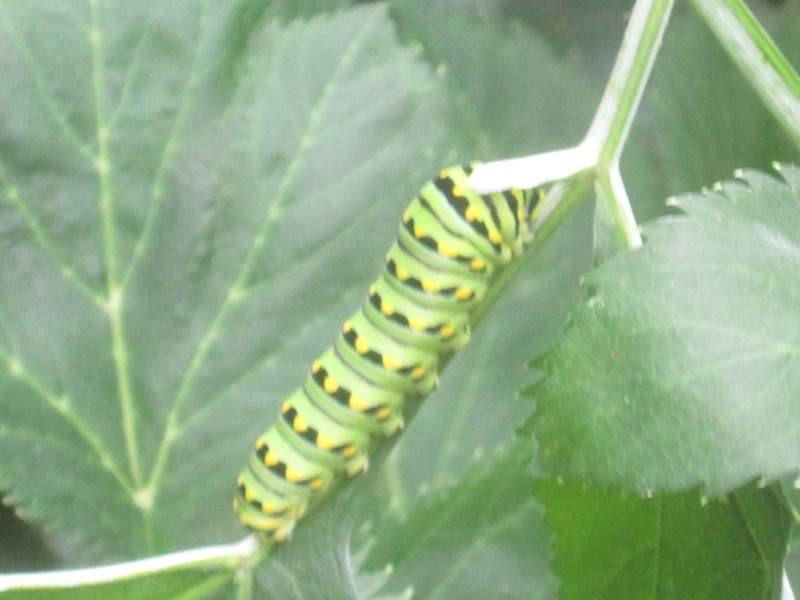 Looking plump and content, rested a handsome Swallowtail caterpillar. It’s bright green color blended beautifully with the leaves of the plant. How marvelous is the human eye that is able to discern between the different shapes and hues of the same color. 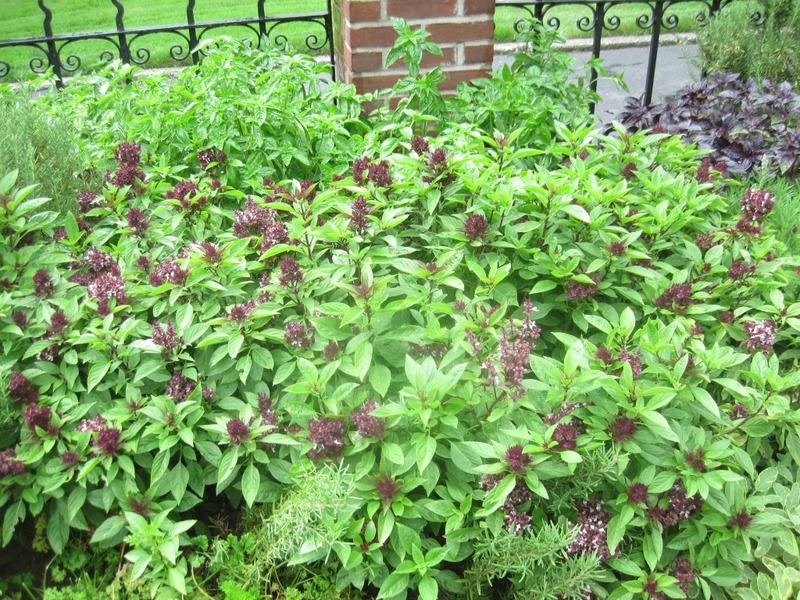 Similarly, we are able to spot weeds amidst similar looking plants. I was hoping the caterpillar would remain on the Angelica and form a chrysalis. It lolled on the herb two days in a row but when I looked today, I did not see any sign of it at all. Just some well molested leaves hanging off the main stem. No matter, I’ll patiently await the butterfly.